Released in the US in April, the Xperia XZs is one of Sony's two new high-end handsets unveiled this year, alongside the Xperia XZ Premium - launched stateside earlier this week. While the XZ Premium is larger and more powerful, the XZs has the advantage of being cheaper, while still offering Sony's new Motion Eye camera (which can shoot slow motion video at 960 fps). Moreover, right now, interested customers can get a pretty nice gift when purchasing the Xperia XZs. 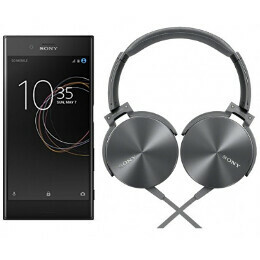 Focus Camera, a Sony authorized dealer, is currently selling the Xperia XZs for $649 (that's $50 off the launch price), and throws in a free pair of Sony on-ear headphones (model number MDRXB950AP/H, normally priced at $119.99). All in all, you're saving a total of $169.99 thanks to this deal. Free shipping within the US is included, and you can choose to get the XZs in three color variants: silver, black, and ice blue. The deal ends on July 1, and you can take advantage of it via the source links below. The Sony Xperia XZs runs Android Nougat, and we're certain that it will be updated to Android O - possibly before the end of the year. The handset is unlocked and compatible with AT&T and T-Mobile, but won't work on Verizon, Sprint, and US Cellular. You can take a closer look at the smartphone by checking out our Xperia XZs review. What phone do you use if you don't mind me asking? I'm truly curious what you like/use because nearly every comment I see of yours is just bashing whatever phone is in the article. He's probably just a kid who's mad because mommy didn't buy her a smartphone. I currently use the S8+ and the iPhone 7 as my daily drivers. I also have the Oneplus 3T, S6 Edge and the iPhone 5s which i dont use and sitting idle. Alnaldo , check post no 8. Just for you jealous pigs i posted it there. your profile pic matches your statement. Why do you think its not true? Notofanboys and Shreyas.s666 ... What happened? Has your poverty caught up with you? Totally silent when i uploaded pics? Cat caught your tongue ? Shreyas.s666 and Notofanboys? No response or lame attempts of come backs? Hahaha. Mouthshut bunch of losers. https://ibb.co/g7tR7khttps://ibb.co/cV4AYQhttps://ibb.co/huxVYQ For the non believers. Not included in the pics , My iPhone 5s which i forgot in my car and the pic clicked by my Lenovo P2 , my endurance champ for when i travel which i also didnt mention to you sad ppl earlier. No i loved Sony at a point, in fact the Sony Z3 was my favourite phone of that year. Later i got the Z3+( Worst Sony phone of all time ) .Last year i got the Z5 premium which also wasn't any good. Both these phones changed my opinion about Sony. Also their design is quite bad for 2017 standards.